Hertford College (/ˈhɑːrtfərd/ HART-fərd) is a constituent college of the University of Oxford in England. It is located on Catte Street in the centre of Oxford, directly opposite the main gate to the Bodleian Library. The College is known for its iconic bridge, the Bridge of Sighs. There are around 600 students at the College at any one time, comprising undergraduates, graduates and visiting students from overseas. As of 2018, the college had a financial endowment of £65m. The first Hertford College began in the 1280s as Hart Hall and became a college in 1740 but was dissolved in 1816. In 1820, the site was taken over by Magdalen Hall, which had emerged around 1490 on a site adjacent to Magdalen College. In 1874, Magdalen Hall was incorporated as a college, reviving the name Hertford College. In 1974, Hertford was part of the first group of all-male Oxford colleges to admit women. Some famous historic alumni include William Tyndale, John Donne, Thomas Hobbes, Jonathan Swift and Evelyn Waugh. More recently, former students have included the first female Home Secretary, Jacqui Smith, the civil servants Jeremy Heywood and Olly Robbins, and the newsreaders and reporters Fiona Bruce, Carrie Gracie, Krishnan Guru-Murthy and Natasha Kaplinsky. The first Hertford College began life as Hart Hall (Aula Cervina) in the 1280s, a small tenement built roughly where the College's Old Hall is today, a few paces along New College Lane on the southern side. In mediaeval Oxford, halls were primarily lodging houses for students and resident tutors. The original tenement, mentioned in the deed of 1283, which was bought by Elias de Hertford from Walter de Grendon, mercer, lay between a tenement of the University (Blackhall) on the west, and a tenement of the Prioress of Studley on the east. In the deed by which Elias de Hertford sells it to John de Dokelynton in 1301, this last tenement is called Micheldhall. The deed was made over to his son, also Elias, in 1301. The name of the hall was likely a humorous reduction of the name of its founder's home town, and allowed for the use of the symbol of a hart to be used for identification. Hart Hall expanded and new buildings were put up. In the early 17th century, the current Senior Common Room was built as lodgings for the principal. From this period also, the main entrance of the hall moved from being a narrow passage off New College Lane to a gate on Catte Street. By the late 17th century, Cat Hall is described as being used as 'the ball-court of Hart Hall'. In the latter part of the 17th century, the principal, Dr William Thornton, provided a proper gate for the Catte Street entrance of the Hall, and decorated with a device of a drinking hart with the motto Sicut cervus anhelat ad fontes aquarum ('As the hart panteth after the water brooks', taken from Psalm 42, verse 1, but in a peculiar translation). Although the current gatehouse is not Thornton's original, it retains the design and motto, and houses the original decorated gates. It has been suggested that this frieze with its Latin motto is the real counterpart of the one translated for the waiting crowd by the title character of Thomas Hardy's Jude the Obscure. Magdalen Hall was founded around 1490 on a site to the west of Magdalen College and next to Magdalen's grammar school. The site is now Magdalen's St Swithun's quadrangle. It took the name of an earlier Magdalen Hall in the High Street, which was founded by William Waynflete in 1448 and then closed on the opening of Magdalen College in 1458. The first master of the grammar school was appointed in 1480, and its original school building was erected in 1486. However, as the hall took independent students as well as those belonging to the College, it quickly became an independent institution under its own principal. During John Macbride's principalship it became clear that the growing, energetic Magdalen Hall should be incorporated as a college to match its academic standing in the University. Since the name 'Magdalen College' was already taken, the favoured option was the revival of 'Hertford College'. Macbride was succeeded as principal by his vice-principal, Richard Michell, in 1868. He brought a bill before Parliament in 1873 for the incorporation of Magdalen Hall as Hertford College. The bill received significant financial support from Thomas Baring, then newly elected MP for South Essex. Baring had been a Fellow of Brasenose College, and had offered a substantial endowment of fellowships and scholarships to that College, but it had been refused, as Brasenose rejected his conditions of restricting the funds to members of the Church of England. However, to ease the passage of the bill, Baring removed his condition to the first instalment of the endowment (subsequent instalments were restricted), and Magdalen Hall was incorporated as 'the Principal, Fellows, and Scholars of Hertford College' (Principalis, Socii, et Scholastici Collegii Hertfordiensis) on 7 August 1874. Thus, Michell became the last principal of Magdalen Hall and the first principal of the refounded Hertford College. In 1877, Henry Boyd succeeded Michell, becoming the second principal of the refounded Hertford College. His energy, good connections and longevity created the modern College as it is today. Boyd's name appears carved on the landmark Bridge of Sighs, and he is commemorated by a memorial in the Chapel (to the left of the chancel) and a portrait in the Hall (at the west end of High Table). Boyd's partnership with the architect Thomas Graham Jackson brought about the expansion of the College and its endowment with its iconic 'Anglo-Jackson' buildings. In 1887, Jackson began work on the Gatehouse, the Hall and its spiral staircase, and the north range of the Old Quad. In 1901, Jackson started building the College's site on the northern side of New College Lane. By 1908, he had completed a new Chapel, which he declared to be his favourite work. Eventually, after much opposition, he built the Bridge of Sighs, linking the Old and New Quads across New College Lane, in 1913. In the two world wars, a total of 171 members of Hertford College died (those of World War I are commemorated by a memorial on the south wall of the chancel in the Chapel, while those of World War II are remembered in a memorial in the portico, to the right of the Chapel door). Notable among them is Major Percy Nugent FitzPatrick, son of James Percy FitzPatrick, who was killed near Cambrai on 14 December 1917. It was with the death of his son that James Percy FitzPatrick made the suggestion after the war's end to keep a two-minute silence each year on Armistice Day. In 1922, the novelist Evelyn Waugh came up to Hertford, famously feuding with his history tutor C. R. M. F. Cruttwell (who was to become the fourth principal of the refounded college, 1930–1939), and later naming a number of odious characters after him. Waugh wrote of his time at Hertford, 'I do no work here and never go to Chapel'. He novelised his time at Oxford in Brideshead Revisited, having his protagonist Charles Ryder at Hertford. Starting from 1965, Hertford made a special effort to encourage applicants from state schools through the Hertford Scheme established by Physics Fellow Neil Tanner, in which candidates were interviewed early, outside the standard application process, and could be offered a place at the College without having to sit the university entrance exam. This had the effect of dramatically raising academic standards within the College, and other colleges introduced similar initiatives. Today, around 70% of undergraduate students at the College come from UK state schools. This percentage of individuals from state schools (out of all UK applicants/students) is higher than at most Oxford colleges. This commitment to diversity is in keeping with Hertford's earlier history of openness throughout the twentieth century; Hertford admitted the first African-American Rhodes Scholar, Alain Leroy Locke, after he had been refused by several other colleges. Geoffrey Warnock served as the 9th Principal of the refounded College from 1971 until 1988, and presided over the latest period of growth, and established the College's leftist credentials. In 1974, Hertford became one of the first five co-educational colleges in the university (the others being Brasenose, Jesus College, St Catherine's, and Wadham). The College now has an almost equal gender balance, with slight variations from year to year. In memory of Warnock, the College has a student-accommodation building near Folly Bridge named after him. He also has a memorial in the Chapel, and a portrait behind High Table in the Hall. 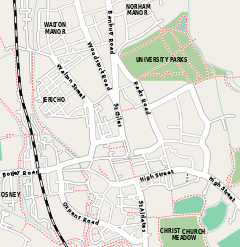 Hertford College's main site is situated on Catte Street, New College Lane and Holywell Street. The site consists of three quadrangles: Old Quadrangle, New Quadrangle, and Holywell Quadrangle. The College also has three large groups of buildings for student accommodation near Folly Bridge: Warnock House, the Graduate Centre and Abingdon House. In addition to these, the College owns a number of houses around Oxford. The Old Quadrangle (known as Old Quad or OB Quad, for Old Buildings) is, as the name suggests, the oldest and the original quadrangle. Its entrance is the through the Gatehouse on Catte Street, directly opposite the main gates of the Bodleian Library. The Gatehouse is a late 19th-century building by Thomas Graham Jackson, bearing the image of a drinking hart above the archway. However, the wooden doors with their colourful floral decoration are the original gates of Hart Hall from the 17th century. The Gatehouse houses the Lodge. Through the Gatehouse, the quadrangle is laid out around a pleasant lawn with a few decorative trees. The lawn is off-limits during Michaelmas and Hilary terms but is accessible during Trinity term for sitting on (at any time) and croquet (on Fridays and Sundays only). In the north-east corner of the quad is the Old Hall, the oldest remaining buildings of Hart Hall, dating from the 1570s. The Old Hall and its adjoining Buttery are now in regular use for dining, especially by the Fellows. Running southwards, along the eastern side of the quad, is a 17th-century building, with oriel windows tucked away on its southern end. Originally, the portion closest to the Old Hall was student accommodation, and the southern portion was the principal's lodgings. Today the building is mostly taken over by the Senior Common Room, with the northern ground-floor room being the Old Library. In the south-east corner is the 18th-century Cottage, the only one of the planned four 'angles' of Dr Newton that was ever built. Originally, this occupied the entire corner, around to what was the chapel (and is now the library). Its southern side was demolished to make way for Jackson's Chapel. The southern side of the quad consists of the Chapel, built in 1908 by Jackson, which has a particularly good acoustic. Its ante-chapel houses a stained-glass window depicting William Tyndale, made in 1911 for the British and Foreign Bible Society, and installed at Hertford in 1994. West of the Chapel is the Library, which was the previous chapel built in the 18th century by Newton. The Library possesses many fine, antique books, most of which belonged to the library of Magdalen Hall. Among these are many rare 17th-century manuscripts and an original edition of Thomas Hobbes's Leviathan given as a personal gift to the College: Hobbes prepared this work while at Magdalen Hall. The western side of the quad has the Gatehouse, with the Lodge, in its centre. On either side of this are slightly earlier buildings, the southern of which is the Principal's Lodgings, and the northern mostly houses the College's offices. In addition, the north-west building has access onto the Bridge of Sighs. Above the Gatehouse is the dining Hall, which is wood-panelled and hung with a number of College portraits. The hall is reached from the quad by a distinctive stone spiral staircase designed by Jackson, and inspired by the spiral staircase at the Château de Blois. The northern side of the quad consists of a building by Jackson, much of which now houses the Bursary. The building is infamous as the site of the incident novelised in Evelyn Waugh's Brideshead Revisited in which Sebastian Flyte, returning from a Bullingdon Club bender vomits through a window into a ground-floor room. The NB Gatehouse and the Octagon as seen from inside the quad. The Clarendon Building can be seen in the background. The New Quadrangle (known as New Quad or NB Quad, for New Buildings) is connected to the Old Quadrangle, across New College Lane, by the Bridge of Sighs, which was designed by Thomas Graham Jackson. The north-western corner of New Quad is taken up by the Indian Institute building, which is not part of Hertford College. Most of the New Buildings are early 20th-century designs by Jackson, except the slightly later frontage onto Holywell Street, on the northern side of the quad. The quad is entered through a gate onto Catte Street, just opposite the Clarendon Building. New Quad is mostly used for undergraduate accommodation. The most significant building in the quad is the Octagon, just north of the gate on Catte Street, which houses the Middle Common Room. It is the 16th-century Chapel of St Mary the Virgin at Smithgate, which formed a bastion in the town walls. An original carving of the scene of the Annunciation can be seen from Catte Street, just beside the gate. Holywell Quadrangle backs directly onto New Quad, and the two are connected by an arched corridor that also contains the steps down to Hertford's subterranean bar. Holywell Quad was built in 1975, and is almost exclusively for first-year undergraduate housing. Its main features are a gate onto Holywell Street, the Junior Common Room in the south-east corner, and the Baring Room (named after Thomas Baring, the College's major benefactor) which is a multi-purpose hall at the top of the southern staircase. Undergraduate students are accommodated for the full three or four years of their study, either on the main site or on college-owned property primarily in North Oxford and the Folly Bridge area. A new Hertford Graduate Centre fronting the Isis was built near Folly Bridge and was opened in 2000. Hertford is home to a college cat named Simpkin, who lives in the College Lodge and is the fourth of his lineage, collectively Simpkins, the collective noun for Hertford College cats; the original was called Simpkin and was introduced by the former college principal Geoffrey Warnock, named after the cat in the Beatrix Potter novel The Tailor of Gloucester. He is provided with a bursary by alumni to cover his food and veterinary treatment. Hertford's exam results are slightly above average. In the Norrington Table of results over the period 2006–2012 it has come 17th, 9th, 18th, 6th, 12th, 5th and 23rd. Hertford College Boat Club is among the leading Oxford college boat clubs: both its women's and men's first boats are in the first division of Torpids and Eights Week, with both M1 and W1 winning "blades" in the 2015 edition of Torpids. The boats and club room are in the Longbridges boathouse on the Isis. With the transition of Magdalen Hall to Hertford College in 1874, the old blue-black of the Hall stopped racing in 1873, and the new red-white of the College took to the river in 1875. Within only seven years of its refoundation, the College came Head of the River in the annual college boat races, in 1881. On achieving that victory, the crew carried their boat all the way back to the College and burnt it just inside the gates. The College archives possess a letter detailing the club's celebrations from the sub-librarian of the Bodleian Library, who spent the night on the scaffolding surrounding the work on the Old Schools Tower, directly opposite the Hertford gate, in case the fire spread to the library. In 2005, the boathouse was gutted by an arson attack carried out by the Animal Liberation Front, in protest against animal testing at the University. The new boathouse was rebuilt on the same site. The College was endowed with a new well-equipped gym in 2011 and has playing fields in New Marston, which include a pavilion with facilities for most major team sports. In August 2013 Hertford College Rugby Club became the first team from the UK to tour Mongolia in official partnership with the Mongolian Rugby Football Union. They played matches against The Mongolia Defense University and the Ulaan Baatar Warriors. Both matches were played in the national stadium and broadcast live on Mongolian national television. In 2017, the team returned to Mongolia, this time playing two matches against the Ulaanbaatar Warriors. Hertford College has the largest and most active music society of any Oxford college, drawing in musicians from around the university, with ensembles including the Hertford College Orchestra, the Hertford College Chapel Choir, the Hertford College Wind Band, the Hertford College Jazz Band and the Hertford College Bruckner Orchestra. There are two competitive organ scholarships. The Chapel's fine acoustic lends itself to concerts and recitals, and it is frequently used for recording. The current Principal of the college, from 2011, is the political economist and former newspaper editor Will Hutton. The college has over 30 Tutorial Fellows in the subjects it offers at undergraduate level. The college has 22 Emeritus Fellows. ^ "Hertford College : Annual Report and Financial Statements : Year ended 31 July 2018" (PDF). ox.ac.uk. p. 23. Retrieved 5 March 2019. ^ "Co-education - Hertford College | University of Oxford". Hertford College | University of Oxford. Retrieved 2018-07-26. ^ a b "Hertford history - Hertford College | University of Oxford". Hertford College | University of Oxford. Retrieved 2018-07-26. ^ a b c d e f g h i j k l m n Hamilton, Sidney Graves (1903). Hertford College. London: F.E. Robinson. OL 23303320M. ^ Kay-Robinson, Denys (1984). The Landscape of Thomas Hardy. Webb and Bower. p. 173. ^ Brockliss, L. W. B. (2016). The University of Oxford: A History. Oxford: Oxford University Press. p. 85. ISBN 9780199243563. ^ "Magdalen Hall". Magdalen College, Oxford. Retrieved 22 March 2019. ^ Goudie, Andrew, ed. (1999) . Seven Hundred Years of an Oxford College: Hertford College, 1284–1984 (2nd ed.). Hertford College, Oxford. p. 70. ^ "South African Military History Society - Lectures - The other Percy Fitzpatrick". samilitaryhistory.org. ^ "Neil Tanner and the Tanner Scheme - Hertford College | University of Oxford". Hertford College | University of Oxford. Retrieved 2018-07-26. ^ "Hertford statistics - Hertford College | University of Oxford". Hertford College | University of Oxford. Retrieved 2018-07-26. ^ "The Simpkin Dynasty - Hertford College | University of Oxford". Hertford College | University of Oxford. Retrieved 2018-07-26. ^ "Hertford College - The Oxford Guide". oxford.openguides.org. ^ "Chapel - Hertford College | University of Oxford". Hertford College | University of Oxford. Retrieved 2018-07-26. ^ "Professor Hagan Bayley - Hertford College | University of Oxford". Hertford College | University of Oxford. Retrieved 2018-07-26. ^ "Professor Charlotte Brewer - Hertford College | University of Oxford". Hertford College | University of Oxford. Retrieved 2018-07-26. ^ "Professor Dame Kay Davies, DBE - Hertford College | University of Oxford". Hertford College | University of Oxford. Retrieved 2018-07-26. ^ "Professor Martin Maiden". Hertford College | University of Oxford. Retrieved 2019-03-22. ^ "Professor Ian McBride". Hertford College | University of Oxford. Retrieved 2019-03-22. ^ "Professor Peter Millican - Hertford College | University of Oxford". Hertford College | University of Oxford. Retrieved 2018-07-26. ^ "Professor Chris Schofield, FRS". Hertford College | University of Oxford. Retrieved 2019-03-22. ^ "Professor Emma Smith - Hertford College | University of Oxford". Hertford College | University of Oxford. Retrieved 2018-07-26. ^ "Professor David Stuart, FRS". Hertford College | University of Oxford. Retrieved 2019-03-22. ^ "Professor David Thomas - Hertford College | University of Oxford". Hertford College | University of Oxford. Retrieved 2018-07-26. ^ "Professor Christopher Tyerman". Hertford College | University of Oxford. Retrieved 2019-03-22. ^ "Professor Claire Vallance". Hertford College | University of Oxford. Retrieved 2019-03-22. ^ "Professor Michael Wooldridge". Hertford College | University of Oxford. Retrieved 2019-03-22. ^ "Professor Alison Woollard - Hertford College | University of Oxford". Hertford College | University of Oxford. Retrieved 2018-07-26. Goudie, Andrew, ed. (1999) . Seven Hundred Years of an Oxford College: Hertford College, 1284–1984 (2nd ed.). Hertford College, Oxford. "Hertford College". A History of the County of Oxford. 3. The University of Oxford. 1954. pp. 309–319. Retrieved 25 February 2012. Newton, R. (1747). Barnard, Toby, ed. Rules and Statutes for the Government of Hertford College, in the University of Oxford. Paternoster Row, London: John Osborn. Wikimedia Commons has media related to Hertford College, Oxford.